Secure Digital eXtended Capacity or 'SDXC Cards' are available in 64GB to 2TB sizes. 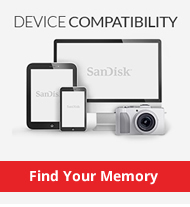 Not compatible with SD / SDHC devices. SDXC memory cards are the next generation of flash memory card, based on the new SD 3.0 specification, SDXC will be the natural successor to the popular SDHC card format. Capacities of the new SDXC memory cards are planned to range from 64GB SDXC up to 2TB SDXC, Sandisk are again one of the front runners having already released a 64GB SDXC card, although Lexar have announced a soon to be released 128GB SDXC card. SDXC Card speeds are to range from 104MB/sec up to a planned 300MB/sec. The SDXC card's exFAT file structure helps consumers record long-duration HD videos. A 64GB SanDisk Ultra SDXC card can store more than eight hours of such video with recording speed of 9 Mbps (HD standard), this makes SDXC memory cards the ideal format for HD Camcorders. Widespread adoption of SDXC memory is expected to occur across a range of digital cameras, camcorders & other consumer electronic products during 2011 and onwards.